The pattern of superpower intervention during the Cold War deeply affected and exacerbated regional and civil wars throughout the Middle East, and the carefully calculated maneuvers fueled by the fierce competition between the United States and the USSR actually provoked breakdowns in fragile democracies. To understand the momentous events that have occurred in the region over the last two decades-including two Gulf wars, the occupation of Iraq, and the rise of terrorism-we must, Khalidi argues, understand the crucial interplay of Cold War powers there from 1945 to 1990. Today, the legacy of the Cold War continues in American policies and approaches to the Middle East that have shifted from a deadly struggle against communism to a War on Terror, and from opposing the Evil Empire to targeting the Axis of Evil. The current U.S. deadlock with Iran and the upsurge of American-Russian tensions in the wake of the conflict in Georgia point to the continued centrality of the Middle East in American strategic attention. Today, with a new administration in Washington, understanding and managing the full impact of this dangerous legacy in order to move America toward a more constructive and peaceful engagement in this critical arena is of the utmost importance. 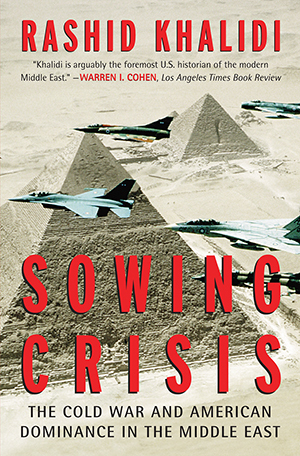 "Khalidi provides a compelling history of modern conflict in the Middle East, arguing that current conflicts are by-products of the cold war and the policies, strategies and priorities of the United States and the Soviet Union. . . . Khalidi has written an important book, essential for anyone concerned about the stability of the Middle East." "Though this brief work doesn’t aim to be an exhaustive survey, it ably gets the reader up to speed on many of the disputes that have made the Middle East a flashpoint in today’s U.S. foreign policy. . . . Concise look at a crucial period in one of the world’s most explosive regions."